The principal city of Greece, situated five miles from its seaport, Piræus, on the Saronic gulf. When, as a result of the Persian wars, Athens attained the hegemony of the eastern Mediterranean, it was already one of the most important commercial cities of antiquity. It retained this commercial supremacy in times of political decay, far into the period of the Roman emperors. Hence numerous foreign merchants did business in Athens, and some of them settled there, forming close corporations which mutually supported each other, and at the same time retained their respective national religions. The practise of their religions and the building of temples were not permitted in the city of Athens, but these privileges were allowed in the Piræus. As early as 333 B.C., the Egyptians possessed a temple of Isis there. There, too, permission was given to the Kιτιεῑς (merchants from the city of Citium in Cyprus) to build a temple to Aphrodite; and somewhat later the Sidonians erected one to their god, Baal-Sidon (Schürer, "Gesch." iii. 58). Together with the wealthy Egyptian and Phenician wholesale merchants, many Jews settled in Athens for commercial reasons and organized a community. 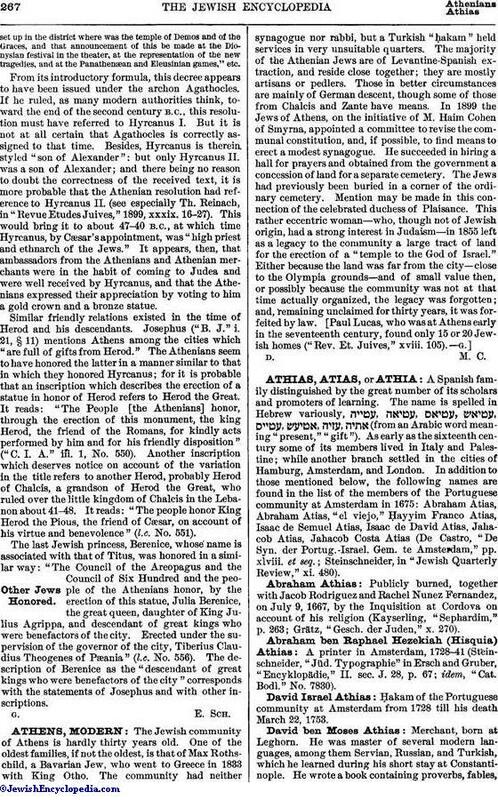 The residence of Jews in Attica in general is testified to by Philo ("Legatio ad Cajum," p. 36; ed. Mangey, ii. 587). From the Acts of the Apostles (xvii. 17) it is certain that there was a Jewish synagogue in Athens. Among the Greek inscriptions found in Athens are some of Jewish origin. "Corpus Inscriptionum Atticarum," iii. 2, contains three, numbered 3545, 3546, and 3547 respectively. In the first two the seven-branched candlestick is depicted. No. 3545 reads: "This is the resting-place of Eutychia, mother of Athenaos and Theoktistes"; No 3546: "This is the resting-place of Theodula and Moses"; and No. 3547: "[Jac]ob and Leontius, descendants of Jacob of Cæsarea." This Jacob probably came from Palestine; for Cæsarea means either Cæsarea Stratonis or Cæsarea Philippi. 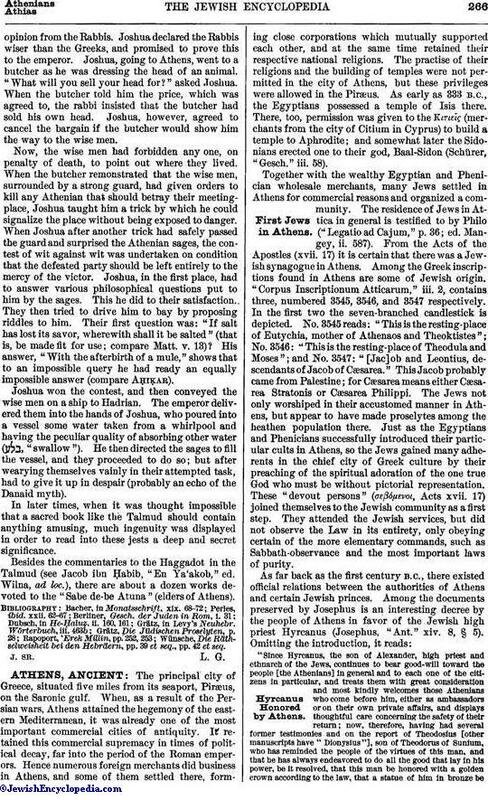 The Jews not only worshiped in their accustomed manner in Athens, but appear to have made proselytes among the heathen population there. Just as the Egyptians and Phenicians successfully introduced their particular cults in Athens, so the Jews gained many adherents in the chief city of Greek culture by their preaching of the spiritual adoration of the one true God who must be without pictorial representation. These "devout persons" (σεβόμενοι, Acts xvii. 17) joined themselves to the Jewish community as a first step. They attended the Jewish services, but did not observe the Law in its entirety, only obeying certain of the more elementary commands, such as Sabbath-observance and the most important laws of purity. "Since Hyrcanus, the son of Alexander, high priest and ethnarch of the Jews, continues to bear good-will toward the people [the Athenians] in general and to each one of the citizens in particular, and treats them with great consideration and most kindly welcomes those Athenians who come before him, either as ambassadors or on their own private affairs, and displays thoughtful care concerning the safety of their return; now, therefore, having had several former testimonies and on the report of Theodosius [other manuscripts have "Dionysius"], son of Theodorus of Sunium, who has reminded the people of the virtues of this man, and that he has always endeavored to do all the good that lay in his power, be it resolved, that this man be honored with a golden crown according to the law, that a statue of him in bronze beset up in the district where was the temple of Demos and of the Graces, and that announcement of this be made at the Dionysian festival in the theater, at the representation of the new tragedies, and at the Panathenæan and Eleusinian games," etc. From its introductory formula, this decree appears to have been issued under the archon Agathocles. If he ruled, as many modern authorities think, toward the end of the second century B.C., this resolution must have referred to Hyrcanus I. But it is not at all certain that Agathocles is correctly assigned to that time. Besides, Hyrcanus is therein. styled "son of Alexander": but only Hyrcanus II. was a son of Alexander; and there being no reason to doubt the correctness of the received text, it is more probable that the Athenian resolution had reference to Hyrcanus II. (see especially Th. Reinach, in "Revue Etudes Juives," 1899, xxxix. 16-27). This would bring it to about 47-40 B.C., at which time Hyrcanus, by Cæsar's appointment, was "high priest and ethnarch of the Jews." It appears, then, that ambassadors from the Athenians and Athenian merchants were in the habit of coming to Judea and were well received by Hyrcanus, and that the Athenians expressed their appreciation by voting to him a gold crown and a bronze statue. Similar friendly relations existed in the time of Herod and his descendants. Josephus ("B. J." i. 21, § 11) mentions Athens among the cities which "are full of gifts from Herod." The Athenians seem to have honored the latter in a manner similar to that in which they honored Hyrcanus; for it is probable that an inscription which describes the erection of a statue in honor of Herod refers to Herod the Great. It reads: "The People [the Athenians] honor, through the erection of this monument, the king Herod, the friend of the Romans, for kindly acts performed by him and for his friendly disposition" ("C. I. A." iii. 1, No. 550). Another inscription which deserves notice on account of the variation in the title refers to another Herod, probably Herod of Chalcis, a grandson of Herod the Great, who ruled over the little kingdom of Chalcis in the Lebanon about 41-48. It reads: "The people honor King Herod the Pious, the friend of Cæsar, on account of his virtue and benevolence" (l.c. No. 551). The last Jewish princess, Berenice, whose name is associated with that of Titus, was honored in a similar way: "The Council of the Areopagus and the Council of Six Hundred and the people of the Athenians honor, by the erection of this statue, Julia Berenice, the great queen, daughter of King Julius Agrippa, and descendant of great kings who were benefactors of the city. Erected under the supervision of the governor of the city, Tiberius Claudius Theogenes of Pæania" (l.c. No. 556). The description of Berenice as the "descendant of great kings who were benefactors of the city" corresponds with the statements of Josephus and with other inscriptions.